The churchyard contains an area of approximately 6270 square yards including the site of the church: the boundaries are, on the North: Kayes Walk, the South: High Pavement, the East: Stoney Street, the West: St Mary’s Gate. St Mary’s churchyard has served at least three churches suggesting that people have been buried here since Anglo Saxon times. The Stone coffin in St Mary’s churchyard was unearthed in February 1912 when the Lady Chapel was being built. 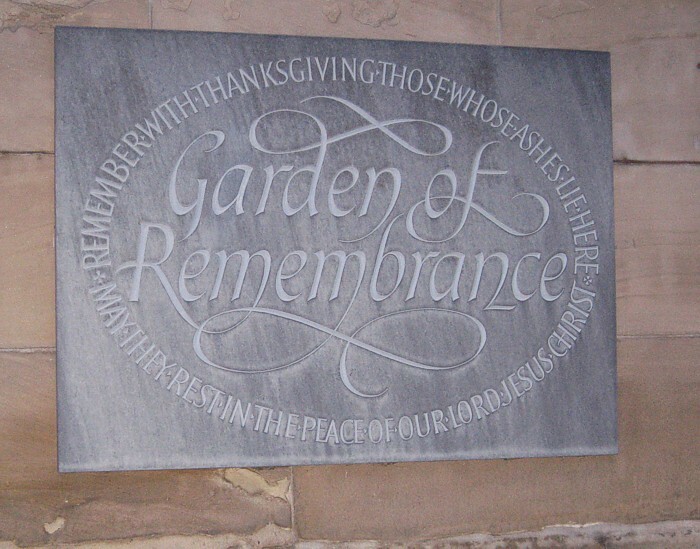 For years it stood lidless on the grass but was moved to make way for the Memorial Garden, dedicated at Easter 2002. Now, filled with earth, it serves as a flower trough near the east wall of the chancel. Stone coffins are occasionally seen in ancient churchyards, sometimes with interestingly carved covers. Although they were for high status burials they were recovered at a later date and reused for other burials. A second stone coffin was found in February 1912 four feet deep but badly damaged and is no longer to be seen. In the Chapter House there is a framed drawing of this coffin which had contained a small silver cross. Alfred Stapleton mentions graves in the same area cut into the bedrock of the churchyard six or seven feet below the level of the church which bore the same distinctive hole cut for the head as can be seen in the stone coffins. In the past churchyard space was re-used and bones from previous graves stored in ossuaries, bone holes or bone houses. Bone holes excavated from the sandstone in the churchyard provided storage when old graves were excavated for new ones. The medieval door on the north wall was once an exterior door into the church. It has been confirmed by English Heritage that the area behind it was once a chantry chapel which was built after the church was completed. It was being used as a bone house in the first quarter of the 19th century when a note was made that the heating furnace was situated under it. A Mr Samuel Smith claimed that between 1819 and 1826 there was a small trapdoor in the churchyard near the wall next to St Mary’s Gate, which appeared to be a bone hole. He mentions two slate gravestones dated 1736 and 1758 forming a side and top to this shaft. He descended the ladder inside the shaft and discovered a cave containing bones. A bone hole excavated out of the rock, probably the one described by Mr Smith and existing as late as 1912 (by the High Pavement boundary wall in line with the south west corner of the church) was marked by a ventilation grating which rested on three side stones. It was filled up with surplus soil excavated during building work on the Lady Chapel in February 1912 and the site obliterated. However, it is described by Alfred Stapleton, who visited it in January that year. It was entered by climbing down a ladder in a narrow brick-lined shaft with the churchyard wall forming the fourth side of the shaft. The cave hollowed out of the bedrock was roughly circular and estimated to be up to 11½ feet wide. Cut into the rocky sides were shelved recesses about 15 inches wide. In 1911 the heating apparatus for the church was operated from a deep rock excavation 40 steps down on the north side of the church between the old vestry and the north transept and reputed to have been a bone hole. It was rediscovered in the 1990s when a paving stone collapsed but was immediately resealed. Possibly the earliest eyewitness mention of the churchyard is that of an action to recover the value of a tombstone broken by the felling of a tree. The year was 1394, the stone (value 6s 8d) was on the tomb of one Robert Langar; the complainant was John Albyn, the plaintiff John Ile and the Vicar at the time was Robert de Retford. 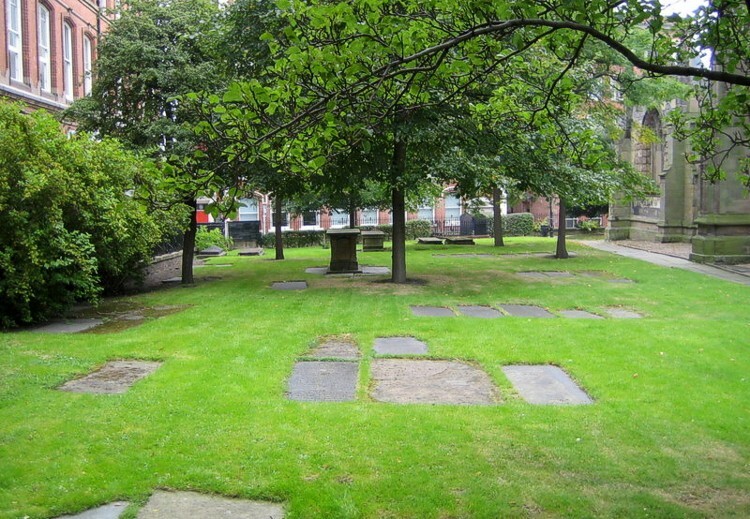 From 1600, victims of the county gallows were interred in the churchyard between the Vicar’s vestry and north transept. On the 7 July 1600 it is recorded that six named persons were “Executed and Buryed”. Other instances of multiple executions are recorded in 1631, 1646, 1647 and 1679. Many prisoners from the Queen’s and King’s gaol who died whilst in captivity are also buried in the churchyard, as was Katherin, a young maid servant unto Richard Singell who hanged herself, 12 July 1605. On 30th July 1776 James Bromage and William Wainer, two young men who had formerly been of good character but found guilty of robbery were made to listen to a sermon, then lie in the graves they would occupy later to check the fit before walking to the gallows in their shrouds. St Mary’s Churchyard was not always the peaceful place it is now. In ancient days churchyards were used for all sorts of purposes which we would find very strange. Merrymaking and church ales were held within its borders. On 12th October 1629, the Mickletorn Jury, a body which was charged with the general oversight of the decorum and well-being of the medieval town prosecuted Ann Hind for wilfully putting her swine into the churchyard, whereof she deserves great punishment. Thoroton’s 1670 map shows a row of houses along the High Pavement frontage of the churchyard, commencing at St Mary’s Gate – with an additional house at the corner of High Pavement and Stoney Street. Blackner describes them as a ‘chantry house belonging to the Bridge Estate and several little dwellings belonging to the vicarage’. It is this day ordered yat the chamberlyns for the tyme being take downe the several howses against the south side of Saint Marye’s churchyard that are now untenanted thereof to the use of this Corporation. Hollow Stone was widened in 1740 and the house on the corner of Stoney Street which had belonged to the Duke of Kingston no longer existed when the 1744 Badder & Peet map was made. The Terrier mentions a house in the churchyard having been taken down to enlarge the space for burials. In 1792 the other houses were demolished and the old churchyard wall and a portion of the churchyard cut away. There are stories of graves being disturbed during the work. At the end of the 18th century the churchyard extended across Kayes Walk to large houses and gardens in a continuous sweep of green. The wealthy Plumptre family had only yards to walk across the churchyard from their house to take their places in the North transept, reserved for their use. The present east wall along Stoney Street was built in 1804, followed by the south wall along High Pavement. In 1806 the churchyard was enclosed by iron railings with a gate at each corner. At the entrance to the churchyard were iron rings that held thick glass globes of whale oil with a floating wick for lighting before gas lighting was introduced to Nottingham. Two of these were recorded in 1928 and one is still to be seen at the High Pavement entrance at the top of Hollow Stone. Kayes Walk was constructed in 1807 and taken off the north side, which had formerly been part of the churchyard. Prior to that there was a public footpath through the churchyard linking St Mary’s Gate with Stoney Street. There was a stile at each end of the path, the one at the east end commonly accepted to have been over 200 years old. Eight old gravestones were propped up against the church wall, the remains of some can now be seen along this busy pathway. The fact that it had originally been part of the churchyard explains why human remains were discovered beneath it when the pavement on Kayes Walk collapsed during work on the footpath in 1998. I bore up for the island – I left a bottle with a paper in it on which were inscribed the names of the ships and the date of our discovery, and along with it I enclosed two silver twopenny pieces of his Majesty’s coin of the date 1772. These, with many others, were furnished me by Rev. Dr. Kaye (now Dean of Lincoln) and as a mark of my esteem and regard for that gentleman; I named the island after him, ‘Kaye’s Island’. At the corner of Kayes Walk and St Mary’s Gate stood a large house where in 1812, Mr Trentham, the owner, was shot at his front door by miscreants who had been hiding behind the tombstones in the churchyard. He survived but his attackers were never caught, despite large rewards being offered. After Mr Trentham’s death in 1820 the house was owned by Mr Daft Smith Churchill, one of the original directors of the General Cemetery. Mr Churchill perished in the wreck of the ‘Forfarshire’ off Farne Lighthouse in 1837. The tragedy is best known for the story of the courage of Grace Darling and her father who rowed out in an attempt to rescue the victims of the wreck. A large monument was erected by his co-directors in memory of Mr Churchill near the Derby Road entrance of the General Cemetery. However after his death his son had it demolished. During excavations for the cellars and foundations a long tunnel was discovered running northwards from the graveyard. A wall was built across it for the foundations of the new building. ... to remove certain monuments, monumental tablets or tombstones relating to deceased persons interred in the Churchyard of the said Parish as specified in plan numbered three so deposited and also any bodies or remains which may be found there under and to re-enter (sic) such bodies or remains and place such monuments, monumental tablets or tombstones in another portion of the said churchyard provided that a plan with the corresponding numbers showing the positions to which such bodies or remains and also the monuments ... tombstones are respectively removed shall be filed in the Registry of our said Court as aforesaid. In 1939 the Choir vestry was built on the north side of the church and some graves were removed. The remains were re-interred in the Southern Cemetery at Wilford Hill and certain tablets and Memorial stones were reinstated. The graves and tombstones removed included eleven names: Askew, Bramley, Broderip, Eddowe, Mather, Oakland, Osborne, Porter, Robinson, Troop, Widerton. In 1948 a Faculty was granted to lay down the gravestones in the churchyard. Exceptions included the terra cotta Sefton memorial and the table tomb to the memory of William Crofts. The ancient stone coffins at present outside the church were moved and any stones which had been part of the church fabric were buried in the churchyard. Alfred Stapleton mentions that both Deering and Blackner had seen ancient tombs and memorials at St Mary’s and thought it was a pity they hadn’t recorded them for posterity. Old stories about obsolete gravestones being recycled include one in premises in St Mary’s Gate and another one in a cellar on Kayes Walk. In 1907 Alfred Stapleton transcribed the memorials in the St. Mary’s Churchyard and Burying grounds. Stapleton recorded a total of about 600 stones, 580 memorials, some illegible, making approximately 550 supplying definite information, one third of which carry visible 18th century dates, one quarter carrying 19th century in addition to 18th century dates in the churchyard. The earliest is 1707 and the latest is 1882, alphabetically Abnet to Young; 440 surnames, with additional 22 unduplicated surnames which were used as Christian names. The Barker Gate memorials range alphabetically from Aldridge to Young and total 210 with 13 surnames used as Christian names. The War Memorial at the south west gate was dedicated in 1922. In 1958 permission was granted to reserve a space at the east end of the church for the interment of cremated remains. This area is now a Garden of Remembrance. 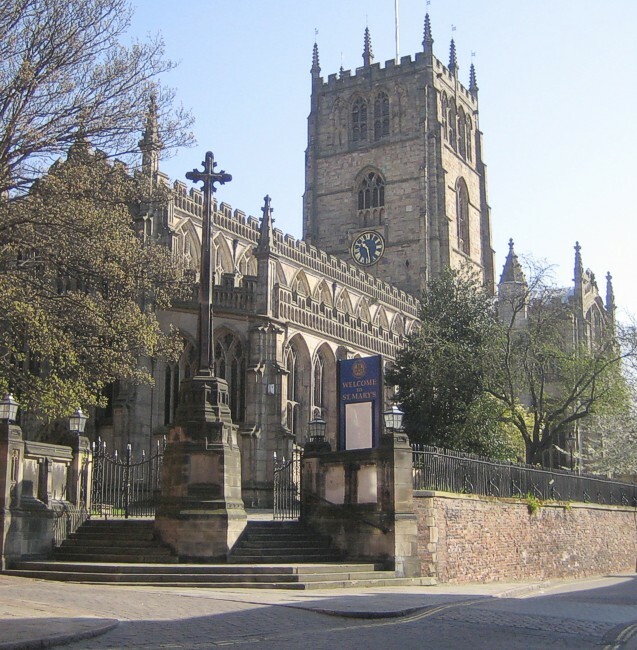 Buried in St. Mary’s old graveyards are people from Crich (Derbyshire), Leeds, several from Leicestershire, Belton near Grantham, Woolsthorpe by Belvoir Castle and Manchester. One interesting memorial was to a Mr Taylor who died on his passage from Tahiti to Melbourne. The oldest stone is one engraved “Morris 1713” lying in the paving to the west of the church. The latest was that of Alderman Twiner dated 1882. One of the earliest, rarest and most unusual memorials in the churchyard today is the clay gravestone made by clay-pipe-maker William Sefton for his two youngest daughters, Elizabeth and Mary who died in 1707 (the earliest date in the churchyard) and 1714 respectively. After nearly 300 years, this stone is now rather weathered but some of the letters stamped onto it can still be seen. The stone remains upright near the path at the northwest corner of the church. Here lyeth the body of Mary the daughter of Wm. & Elizabeth Sefton who departed this life May the 30th in the 6th year of her age in 174. Here lyeth the body of Elezabeth ye daughter of Wm. & Elezabeth Sefton who departed this life May the 29 in the **th year of her age in 1707. Bearing in mind how it was made, this stone must have been made after the death of the second daughter. On the north (Kayes Walk) side of the churchyard is the grave of William Doubleday Crofts, chief ringer and conductor of St Mary’s bell ringers in the 1770s. Their latter Days were full of pain. 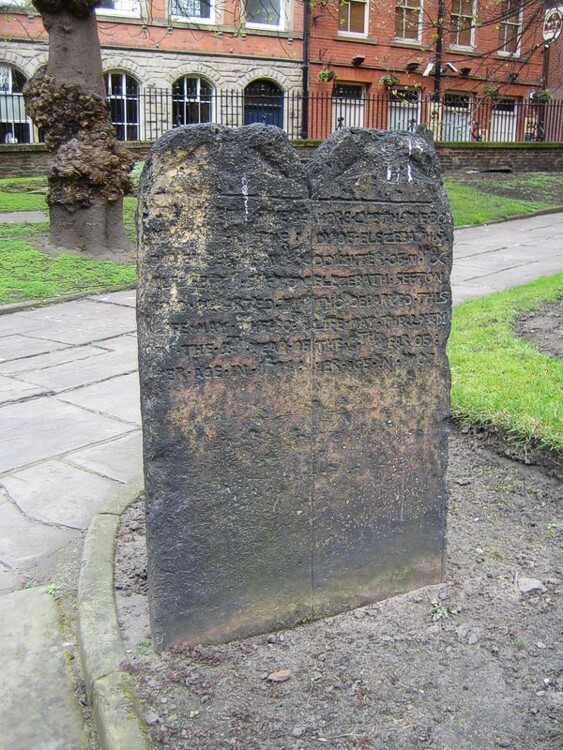 The sandstone gravestone of George senior was heavily weathered and became impossible to read. A new slate memorial with the freshly engraved inscription was inserted into it for the Bicentenary of the 1807 abolition of slavery. In memory of Isaac Beardsley the son of Thomas & Eliz: Beardsley who Departed this life the 9th day of November 1765: in ye 12th Year of his Age. This headstone was recorded in 1907 by Alfred Stapleton but is no longer to be found.